Lisa has one of the most important jobs at NZ On Air - she makes sure people get paid! What exactly do you do day-to-day? I receive a large number of production reports each week and one of my main jobs is ensuring they all comply with their funding contracts as well as resolving any budget issues that may arise with the production company. 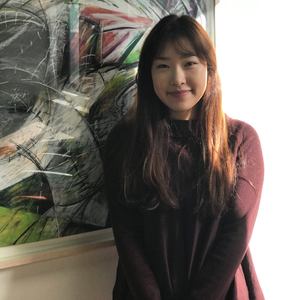 I also take responsibility over core financial accounting duties, communicating with stakeholders to make sure they meet their milestones and receive their funding on time. As I've developed my career in finance, I've found the specifics of the media industry to be a learning curve. Luckily my team is there to back me up, providing me with strong support, encouragement and information so that we can always meet our goals. Moreover, seeing the content and incredible work done by the production companies I work with daily has allowed me to learn a lot about the industry, honing my instincts and making me proud of the work I do. When you’re not at work what’s your favourite place to be and why? I enjoy walking and the usual place I go is Tawatawa Reserve near where I live. The view from the hill is always amazing, especially at sunrise and sunsets. What’s something surprising people won’t know about you? I’ve lived in a lot of different cities and countries before I settled in Wellington. I once lived in Canada when I was 9 and learnt classical music, playing piano and flute. 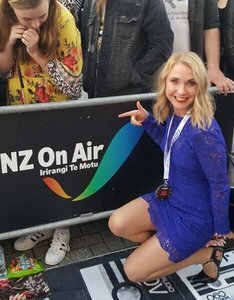 Hayley is our newest newbie - she started at NZ On Air in September 2018. 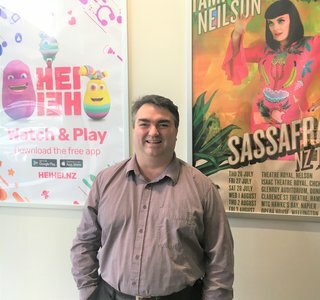 I’m a bit of a hybrid who works across both the Funding and Music teams at NZ On Air. Day to day I contract and manage NZ On Air’s funded music projects and then every few weeks I also get to assess the exciting new proposals submitted through the NZ Media Fund. I have spent most of my career on the other side of the funding fence and I really do know how hard our creators, producers and musicians work to get something off the ground. Stepping into this role it has been mind-blowing for me to see how much content Kiwis produce and how many incredible ideas there are out there. I am proud to be part of a nation brimming with inspiring story-tellers, innovative thinkers and talent and this is what excites me about my work. The biggest challenge for me in this job is therefore simply dealing with the fact that the needs of our creators far exceed the available funds. Through my life in music I’ve been fortunate to experience a good chunk of the world and more arts and music festivals than I can count. I still love to travel and discover new places, cultures, food, art and music for obvious reasons! At home in Wellington though I’m happy just flying round the bays on my bike. It’s a good way to get some perspective and take in the outdoors, although sometimes our outdoors threaten to take me in - especially when biking next to Te Whanganui-a-Tara! I whakapapa to Shakespeare on one side of my whānau and to Clara and Robert Schumann on the other. I spend half my time reading and assessing the great applications for funding that we get and half my time trouble-shooting. I oversee the contracting of most of NZ On Air funding, including ensuring that producers have actually met all our funding requirements. I then get involved in monitoring all our funded contracts, particularly when something tricky or unexpected crops up… such as responding to any health and safety incidents which are reported to us. For the first year of the NZ Media Fund, I particularly enjoyed chairing all the funding team initial assessment meetings. As a funding assessor, I’m often focused on the business case of a potential project. Questions such as: Does it's budget make sense? How large is the likely audience? Is it clear from the proposal how much content, and in what format, will be produced? What are the biggest challenges in your job? Has it changed over time? The biggest challenge for me is remembering names. There are so many people who we interact with on a weekly basis, so I apologise to all the Peter’s who I have called John. I came to NZ On Air with a pretty good knowledge of NZ television, from over a decade working in jobs at places such as Sky TV and Māori Television. However being at NZ On Air has given me wider interaction with the entire local industry. I’m still getting to grips with who’s who in the NZ radio industry, but I’m getting there. I feel lucky to have been part of the NZ On Air digital assessment and contracting team through a period of time where online video has moved from artistic experimentation to a mainstream format. A cinema, or a theatre, seeing something weird. I just love seeing something unexpected, surprising and moving… and that still mostly happens to me at film festivals, comedy festivals and Bats Theatre in Wellington. It has the added bonus of me generally knowing who actors/writers/directors are when producers pitch them to us as new talent. I still very occasionally hear my 8-year-old voice on RNZ National, as I spent a few hours in an Auckland studio in the early 1980s saying things like “wow”, “tell us another story” or “that’s amazing”. I think it was for the Erratic Attic Radio Show, because I still have a badge they gave me at the time. 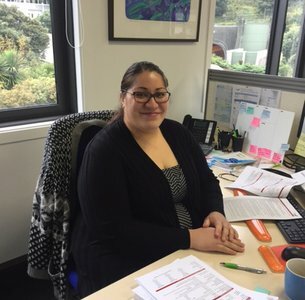 Hilaire Carmody joined NZ On Air in January 2018 - with the big job of keeping our Chief Executive in line. How is your job of EA to the CEO different to previous jobs? I’ve previously been working in the not for profit sector, where we rely on funding to achieve our mission. Sometimes it can be a daunting and relentless task to keep asking for money. It’s great to be on the other side knowing that every day my organisation is helping New Zealanders create the amazing content that they’ve been working hard to make a reality. What are the biggest challenges in your job? This role requires a lot of juggling, there are always multiple priorities that need to be met. I often feel like my head is a web browser with about 50 tabs open at once. When you’re not at work what’s your favourite place to be and why? During the day searching through op-shop and vintage stores for great bargains. I’m rather chuffed that our office is across the road from a terrific Salvation Army store. During the night, down at the Fringe Bar on Allen street, it’s my favourite venue. There is always an interesting show with hot new talent on stage; be it burlesque, comedy or live music. What’s something surprising people won’t know about you? I used to fly and have proudly landed a prop plane at Rongotai / Wellington Airport – apparently it’s listed as the 15th most scariest airport to land in the world. I figure if I can achieve that, I can achieve anything I set my mind to. Robyn is our 'frontline'. We share her with the Broadcasting Standards Authority. What do you do? 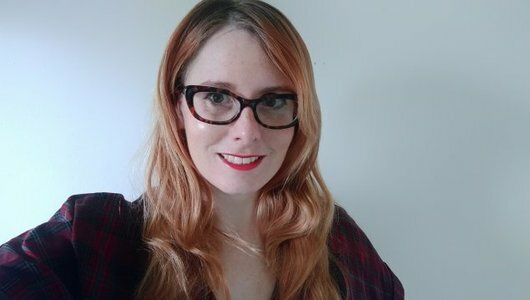 I am the Receptionist and office Administrator for NZ On Air, which means I am the first friendly face people see when they walk in the door to our office, or contact via phone. I also organise most of the travel for our staff and help out with stakeholder and other various office events. How is this different from what you’ve done before? Previously I was working in Scotland for the Forestry Commission making maps and dealing with land ownerships and tree disease outbreaks so this is a very different role for me. I love being able to deal with people face to face in this role and working with such an eclectic group of people, no day is the same. What are the biggest challenges of the job? I think the biggest challenge for me was after spending so long living in the UK coming into this job and learning about all the new NZ music artists who I had never heard of. Keeping up to date now with all the new screen content and music we fund can be hard as there is so much great new stuff to listen to and watch. When you’re not at work what’s your favourite place to be and why? Friends and family are everything to me so when I am not catching up with people, getting out and about socialising, I love experimenting with new recipes in the kitchen and baking. I love being out in nature so going on a big long bush walk or a swim on a sunny day is where I am happiest! Who is your favourite music artist? My favourite NZ artists would definitely have to be Shapeshifter. I would see them every year they toured in Scotland. I have also recently been listening to Lord Echoafter seeing him live. Outside of NZ it would be Michael Kiwanuka who is an R&B /soul artist from London. What’s something surprising people won’t know about you? I have been playing and Dj-ing house music on vinyl since I was 20 years old and I still play out and put on my own events every now and again. It is definitely my biggest passion! Hannah started out as Online Promotions Assistant, working both for NZ On Air as a whole, and the Music channels. Now she spends all her time with the Music team. My role is Music Promoter- Content. I work to help connect New Zealand songs with New Zealand audiences. This ranges from social media management to delivering songs to radio and other broadcasters. 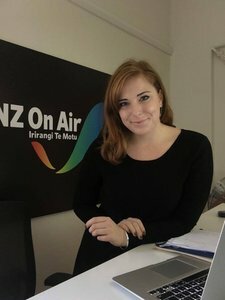 How is it different to your previous role with NZ On Air? A big part of my new role is creating and distributing NewTracks, a compilation of new songs from NZ artists each month. 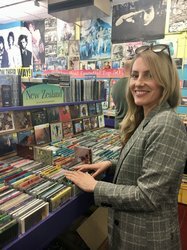 This means selecting 28 new songs a month, sequencing them, creating artwork and digitally and physically distributing them to different radio stations and broadcasters throughout Aotearoa. What are you finding the biggest challenges of the new role? There is a quick turnaround to create NewTracks each month and a challenge I face is organising 28 songs from 28 different artists within a short time frame. Things can change pretty quickly in this part of the industry so we need to remain really flexible and adapt to things happening at the last minute. I love to be near (or on) the ocean - I grew up near the beach and still love being near or on the water. If I’m not near the water I also love writing, playing and listening to music. When I was a teenager I appeared as an extra in our first NZ On Air-funded daily soap opera - Shortland Street. Nicole comes from a broadcasting background, and a well-connected family. I am the Funding Advisor for Community Broadcasting. I look after Spoken Radio, Access Radio, Pacific Radio and Regional Media. How is it different to your roles prior to joining NZ On Air? This is a totally different role to the ones I’ve previously had. I come from a broadcasting background, 14 years behind the mic and later behind the scenes as an operations manager. I really enjoy this role because it challenges me. One day I could be writing papers recommending funding for some great Kiwi content, the next I could be meeting with one of my awesome stakeholders watching a poetry recital in beautiful Dunedin! It’s a wonderful role that makes me feel good about the work I do to get Kiwi content funded. What are you finding the biggest challenges of both settling in and delivering the new strategy and processes? I had big shoes to fill coming into this role as the previous Community Broadcasting manager was well respected and loved by our stakeholders. The wonderful thing about our stakeholders though, is that they are all amazing people and I get phone calls just to chat or received lovely welcoming emails which made my transition less daunting. As for the new strategy, this is an exciting time for NZ On Air. The technology age is well and truly upon us and NZ On Air have embraced it and are adapting to meet the rapidly changing environment. The NZ Media fund continues to champion NZ content and content makers. As the funder we want all our providers, producers and musicians to succeed - when you succeed we succeed! My favourite place is anywhere with my two kids Arty (6) and Senara (5) and my partner Hannay. My kids are my world and it could be us lounging around at home watching Moana for the 100th time or down at the local court shooting some hoops with them. I am 125,233th in line to the British throne. The Queen is a great Aunty and Will and Harry my cuzzie bros. My great great great grandfather is King George III (yes the mad one!) In a nutshell he had three sons to Hannah Lightfoot, a seamstress, before marrying Queen Charlotte. Hannah and her sons were exiled and given the last name Rex. One settled in Tasmania in Australia and his grandson came to a little Island in the South Pacific (best island, btw) called Niue. He settled in Niue and the rest is history!